Celebrating 13 Years of Incredible Fun! - Incredible Pizza Company - Enjoy our huge all-you-can-eat buffet, indoor Go-Kart Races, Bumper Cars, Route 66 Mini Golf, a huge video game arcade with prizes, Bowling, and more! We can’t believe we’re entering the teen years!!! This weekend, we are celebrating 13 years of great food and fun at Conroe’s Incredible Pizza Company! Thanks to our Incredible guests, our dream of bringing the festive atmosphere of the 50’s era to Conroe, has been a reality. It has been a pleasure serving this community through the years, and we look forward to making many more memories in the future! We could not have done it without you, our loyal guests! From the bottom of our hearts, thank you so much for 13 Incredible years! We’re so excited about this anniversary, that we thought we should celebrate all weekend long! 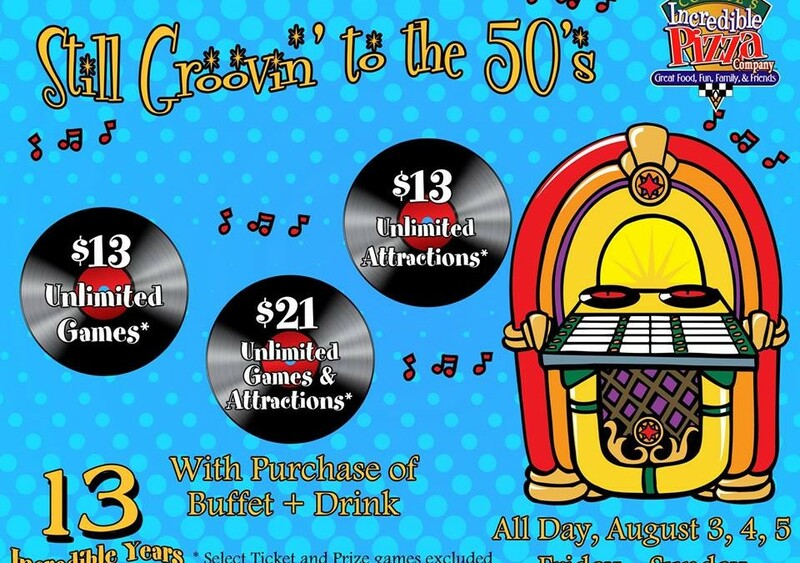 The anniversary fun begins Fri., Aug. 3 and lasts through Sun., Aug. 5! Our birthday special lasts all day long, each of those days. Get your family and friends together, and come celebrate with us! In honor of 13 incredible years, the special for the weekend includes $13 unlimited video games* or $13 unlimited attractions* with the purchase of a buffet and drink. Or, if you want to have maximum fun, you can get both unlimited video games* and unlimited attractions* for $21 with the purchase of a buffet and drink! 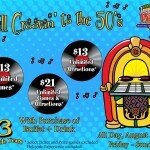 Just think, as the temps rise outside, you’ll be keeping cool and groovin’ to the oldies with us! The unlimited buffet will be fully loaded with our specialty pizzas, homestyle entrees, baked potatoes, fresh salad bar, made-from-scratch desserts & cinnamon rolls!!! Mmmm. Fill your cup as many times as you’d like with unlimited drinks from the soda fountain! For tons of action and fun, the Fairgrounds is where it’s at! Take a trip back in time with some classic video games, and play the latest and greatest ones, too! Fuel the need for speed at the indoor Go Kart track and get stealth in the Laser Tag arena! Show your skills on the Mini Golf course while traveling through historic Route 66, and throw a strike at the Mini Bowling alley! Bump yourself silly in the expanded Bumper Car arena! It’s been 13 Incredible years, and we cannot wait to celebrate with you at Conroe’s Incredible Pizza. Come party with us Fri., Aug. 3 – Sun., Aug. 5! *select ticket and prize games not included. Hologate not included.